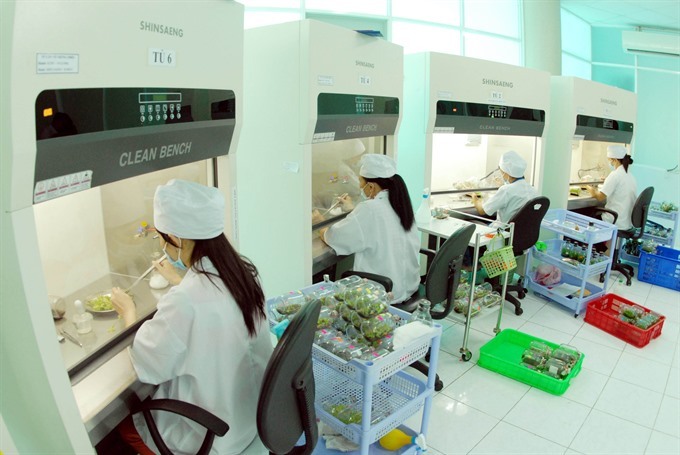 HÀ NỘI – As the Southeast Asian country is looking to boost a high-tech agriculture, firms are looking for modern technologies in the world to apply in farming production. Minister of Agriculture and Rural Development Nguyễn Xuân Cường said that the bottleneck of the agriculture sector was technology. He said his ministry was promoting connections with leading farming technology companies from Switzerland, the Netherlands and Israel as well as other countries with a developed agriculture sector to provide opportunities for Vietnamese agricultural firms to look for appropriate technologies. Many Vietnamese firms are now aware of that they should not import outdated machinery and technologies but look for advanced technologies. However, the most difficult thing is how to find the appropriate technologies. Lương Minh Tùng, Chairman of Yên Phú Beef and Dairy Cattle Breading Joint Stock Company in northern Ninh Bình Province, said that his company had a worry about how to preserve meat. In many countries, beef-preserving technologies were very good which could ensure meat quality up to three months, Tùng said, adding that his company was looking for a partner with such technology. Nguyễn Văn Linh, Chairman of Bắc Giang Province People’s Committee, said that the Northern Province which was known for lychee as a specialty and was promoting export of this type of fruit, expected to find a suitable preservation technology. The lychee harvest lasted only one month, inserting large pressure on consumption. Thus, lychee preservation technology was very important. A number of companies from Israel, the Netherlands, and Switzerland were also looking for providing technologies and cooperating high-tech agricultural production in Việt Nam recently. Recently, more than 30 Israeli companies visited Việt Nam to look for co-operation opportunities. Vũ Kiên Trung, general director of Khang Thịnh Irrigation Technology JSC, sole agent of Israel-based Netafim in Việt Nam, was quoted by the Đầu Tư (Investment) newspaper that drip irrigation technology was initially completely strange to Việt Nam’s agricultural production but now gaining more popularity. The newspaper quoted Ambassador Dương Chí Dũng, Head of Việt Nam’s Permanent Mission to the UN and other international organisations, as saying that many Swiss corporations wanted to co-operate with Vietnamese firms in agricultural production, especially in processing. Swiss companies were especially willing to study and develop appropriate technologies for Việt Nam and co-operate in technology transfer, according to Dũng.